Recently, at a Tweetup, several of my online buds admitted that they sleep with their laptops. They said they check their email when they get up to go to the bathroom in the middle of the night. Sorry guys, but that’s just nuts. I’ve rebelled. This summer, for the first time in a long, long time, I unplugged for a couple of weeks. Two weeks – count ’em – unplugged. No computer. No email. No compulsive tracking of Twitter. No updating any of the three blogs I write. No FriendFeed, Facebook, StumbleUpon, Flickr, or iPod Touch. No Seesmic. No Skype. No TV. DIdn’t even read a newspaper most days. The world kept turning round and round. Clear thought returned to my work-addled brain, and after a few days, a flood of new ideas returned. In those weeks, my AdAge Power 150 ranking dropped from 24 to 66. Big whoop. It’s since edged its way back up the list. Other than that, there was no visible impact on my business. It’s not easy ekeing out time to think. Despite the economy, I’ve never been busier than I am this year. And the busier I get, the easier it is to get caught up in the day-to-day and not take time to think. I have begun to righteously guard my creative time. I don’t start my work day until 11 because I do something really radical in the morning: I think. But once I get started, like so many other people who work online, it’s a non-stop race that often doesn’t wind down til the wee hours of the morning. All around me, I see people going from task to task, meeting to meeting (HOW does anyone get anything done if they have to go from one meeting to another day after day?) One-offs take the place of strategic plans, and everything has to get done right now. All this craziness has a price. o	Creativity. It requires some quiet time alone. Years ago, I interviewed one of my all-time heroes, Howard Rheingold, the brilliant author, educator, and futurist. I asked him how he got so much writing done. And he told me you have to zealously guard your creative time every day, refusing to let anything else interfere. It was some of the best advice I ever got. o	Health. There’s no time for exercise unless you get up before dawn. Eight hours of sleep is a distant memory. Stress kills. That’s been proven a thousand times over. o	Diet. Who’s got time to eat healthy between meetings? o	Family and friends. There’s no time for quality time. I can’t tell you how many of my friends and acquaintances with young children see them for only an hour a day, even though their kids won’t be kids forever. Here’s my pledge: I’m going to keep taking time for thinking, dancing, friends, and family. No matter what. I do get 8 hours of sleep a night, even with my laptop and two dogs:-) And I exercise every day, at least a half hour dog walk and usually Pilates as well, or the gym at least 3x a week. And I eat three meals. Nevertheless, I work constantly and am online constantly. How do I do it? I live alone:-) With a family, no chance. Well, I’ve been known to sleep with my laptop (though now so much anymore – definitely when I was freelance). Not a great bedfellow…. Indeed, these craze about earning money yields to different consequences. I remember a friend who suffered from UTI because he usually doesn’t respond immediately to the call- he is too busy monitoring his metrics. However, his earnings were able to pay his hospitalization. To think of it, he wasn’t able to make the most of his earnings because of that. But you are right: bringing it into bed for a few emails or some writing before turning in is one thing. Actually “sleeping” with it or making it a habit to keep it by the bedside is insanity. I’m also afraid I’ll crush it when I get up in the middle of the night to go to the bathroom. One other thing in my list of must-haves: naps; late afternoon/early evening naps rock. From time to time it is important to let your brain recover from all the craziness of the work day. I thank you for writing this post. Isn’t the freedom to be with our thoughts and our families the reason why most of us work at home and on the internet in the first place? It is so easy to get caught up in the online addiction and social media communication frenzy that we lose sight of what is real and important. You’ve done us all a favor by bringing to the forefront. Actually, I walk about 2 hours every day out in nature with my dogs, and I often wonder how folks who don’t take those sorts of breaks manage to stay sane. Or *if* they do. Found this post thanks to @George_Williams. 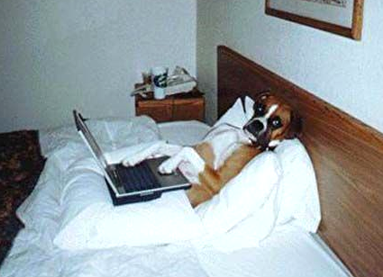 Love the photo of the dog with the laptop. I do think it is possible to be very fit and be on my computer a great deal of the time. I do go to sleep with my laptop by the side of the bed. It is really interesting and useful article. you really know the importance of all the things like friends, family and other things which is necessary to live a good life. I am surprised to see many peoples around me who only things about their career nothing else. O god give a little bit mind to those mad peoples.